*Corresponding author: Mohammed Alorini, MD, Department of Pathology, Anatomic Pathology Laboratory, Rouen University Hospital, 1 Rue de Germont, 76000 Rouen, France. Copyright: © 2018 Alorini M. This is an open-access article distributed under the terms of the Creative Commons Attribution License, which permits unrestricted use, distribution, and reproduction in any medium, provided the original author and source are credited. Cutting injuries and needle-stick injuries constitute a potentially fatal danger to pathologists. We evaluated such injuries in four french university anatomic pathology laboratories and analyzed the effect of the using of cut-resistant gloves to prevent these injuries. For this study, we designed a 12-item online survey to assess the location of the laboratory, the number of years of practice, detailed questions about the use of cut-resistant glove including: Weather the pathologist started using them before or after his residency, frequency of wearing it, on which hand he or she wear it, History of hand-cut injuries with detailed information about the affected hand and the moment of the accident, Declaration of the accident and weather blood tests for infectious diseases such as human immunodeficiency virus (HIV), hepatitis B virus (HBV), and hepatitis C virus (HCV) were done. 17 of the 42 pathologists who participated in our study were sustained a hand injury. Most injuries were located at the non-dominant hand. Only 3 of 17 pathologists were wearing a cut-resistant glove when the injury happened, and those injuries turned to be a needle-stick injury caused by the tip of the blade or by a pin. Cut-resistant protective gloves are an effective and cost-effective completion of personal occupational safety measures in surgical pathology. We strongly recommend the use of such gloves, especially when handling a fresh surgical specimen. Pathologists pass their time mainly on grossing surgical specimens or reading tissue slides. When dealing with surgical specimens, either fresh or fixed, pathologists use various extremely sharp blades and scalpels. Not surprisingly, the constant use of such instruments quite frequently leads to injuries. Cutting injuries and needle-stick injuries could vary from harmless superficial wounds to deep lacerations. An additional danger associated with the handling of fresh or partially fixed human tissue is the danger of transmission of blood-borne diseases . In this article, we evaluate the prevalence of hand-cut injuries among pathologists in four french university hospital anatomic pathology laboratories (Amiens university hospital, Cean university hospital, Lille university hospital and Rouen university hospital). These university hospitals were chosen because they are administratively grouped together. Due to the unavailability of detailed report about each hand injury, we were forced to conduct this study using a survey questionnaire. This is an important limitation of our study. For this study, we designed a 12-item online survey using the platform www.google.com/forms/ (Google, CA, USA). The survey assessed the location of the laboratory, the number of years of practice, detailed questions about the use of cut-resistant glove including: Weather the pathologist started using them before or after his residency, frequency of wearing it, on which hand he or she wear it, History of hand-cut injuries with detailed information about the affected hand and the moment of the accident, Declaration of the accident and weather blood tests for infectious diseases such as human immunodeficiency virus (HIV), hepatitis B virus (HBV), and hepatitis C virus (HCV) were done. Before circulating, we tested the survey for usability and technical functionality. It was then sent to the head of pathology department of every participating hospital via email who took the mission of distributing it across working pathologists in their departments through mailing list. Survey collection was open during the period from September to November 2017. A total of 42 pathologists were participated. Because the survey was spread by the head of pathology department of every participating hospital, we could not correctly determine the number of recipients and thus did not calculate a response rate for the survey. The 42 pathologists participated in this survey are practicing their job since 1 to 35 years with an average of 9 years including the years of residency program. 62% of pathologists responded that they always use cut-resistant gloves while 14.2% of them use cut-resistant gloves from time to time. The remaining 23.8% of them do not use cut-resistant gloves at all. The majority of pathologists (74%) who use cut-resistant gloves started to wear them while they were in residency program. The rest (26%) started to wear them after their residency program. About 78% of those pathologists wear the cut-resistant gloves on the non-dominant hand (the non-cutting hand, which holds the surgical specimen), while 22% of them wear the cut-resistant gloves on both hands. 18.8% of pathologists who usually use cut-resistant gloves do not use them when manipulating a fresh surgical specimen. To wear a cut-resistant glove, pathologists start by wearing a latex glove then wearing the cut-resistant glove and then covering it by another latex glove. This "sandwich" technique insures the cleanness of the cut-resistant glove and more importantly protect the pathologist hand from formalin leakage when the covering latex glove is cut. All pathologists, who use cut-resistant gloves, reported that the covering latex glove eventually gets cut while performing grossing. About 40.5% (17 pathologists) of total pathologists participated in this survey reported having one or more hand injury ranging from one to about ten times with an average of two times. These injuries usually affect the non-dominant hand (82%), and they happened while installing the blade on handle, cutting a surgical specimen or while cleaning the blade. 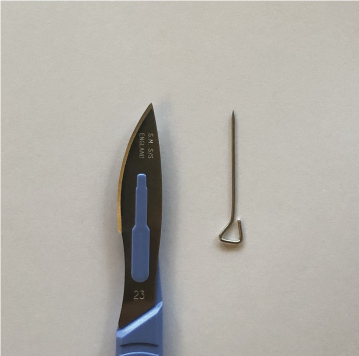 Only 3 of 17 pathologists (17.6%) were wearing a cut-resistant glove when the injury happened, and those injuries turned to be a needle-stick injury caused by the tip of the blade or by a pin (Figure 1). After having an injury, 82.4% of pathologists declared the incidence and did a blood test for blood transmitted diseases HIV, HBV and HCV. Blood-borne diseases like HCV and HIV remain epidemiologically important diseases and constitute a potential danger for medical staff including pathologists. Standard occupational safety measures should take into account that an infection of a patient might be unknown to both clinician and pathologist at the time of tissue examination . Therefore, standard safety measures should be always taken. Our study shows that cut-resistant gloves are very effective in preventing cut injuries, as none of the pathologists were affected by a cut injury. However, cut-resistant glove fails at handling penetrating injuries. The 3 pathologists who received an injury while wearing a cut-resistant glove stated that they were penetrating injuries caused by the tip of the blade or by a pin. Particular attention must be paid to this limitation of cut-resistant glove. Combined puncture and cut resistant hand protection systems do exist, but the glove thickness markedly interferes with handling of surgical specimen . Cut-resistant gloves are thin and very flexible; thus surgical specimen can be handled with ease. Concordant with our results, two studies found that cut-resistant glove are very effective in preventing cut injuries [1,3]. Pathologists reported that the latex glove which cover the cut-resistant glove usually gets cut while performing grossing. This result can be interpreted in two ways. Either the cut-resistant glove prevented unintentional hand-cut, or that pathologists get careless as they know they will be protected by the underlying cut-resistant glove. As the majority of pathologists started to wear cut-resistant gloves while they were in residency program, we think that the implementation and encouragement of this practice at an early stage participated to consolidate and emphasize this good habit. We think that cut-resistant gloves were not introduced at an early stage to the 23.8% of pathologists who does not use them. In our pathology laboratory (Rouen university hospital), cut-resistant gloves are offered free of charge by the department and the use of them is highly encouraged but not enforced. In the mean time, there are no clear recommendations on the use of cut-resistant gloves. Neither the International Organization for Standardization (ISO15189:2012 specifies requirements for quality and competence in medical laboratories) nor the College of American Pathologists Laboratory Accreditation Manual 2017 do mention the use of cut-resistant gloves [4,5]. In the absence of such recommendations pathologists are divided in three categories when it comes to cut-resistant gloves. First, those who wear them on one hand, the non-dominant hand. Second, those who wear them on both hands. Third, those who does not wear them at all. Cut-resistant protective gloves are effective and cost-effective in preventing hand-cut injuries. We strongly recommend the use of such gloves, especially when handling a fresh surgical specimen. Fritzsche FR, Dietel M, Weichert W, Buckendahl AC (2008) Cut-resistant protective gloves in pathology-effective and cost-effective. Virchows Arch 452: 313-318. Woods JA, Leslie LF, Drake DB, Edlich RF (1996) Effect of puncture resistant surgical gloves, finger guards, and glove liners on cutaneous sensibility and surgical psychomotor skills. J Biomed Mater Res 33: 47-51. Pritt BS, Waters BL (2005) Cutting injuries in an academic pathology department. Arch Pathol Lab Med 129: 1022-1026.